After two weeks away, I was anxious to get back to the garden to see how everything had coped with the cold weather that has been occurring in Mudgee. I knew that there had been many frosty mornings, and in fact, two of those mornings had been around -7.5C, which is decidedly chilly. As far as the garden is concerned it was a somewhat dispiriting homecoming. A lot of it was looking much the worse for wear, with some plants leaving me to wonder if they will revive when the warmer weather arrives and quite a few seeming to have disappeared altogether. Here are my six for this week; not all disasters, though. ONE: My Aeonium arboreum 'Schwarzkopf' is looking very miserable indeed, even though it's under cover, and has managed in this postion in previous winters. It will recover, I'm sure, and I'll use the opportunity to trim it back into a better shape. Two: A sadder story belongs to Coprosma repens 'Ignite' which was looking quite splendid, and is now but a shadow of its former self. I fear there's no coming back from this sorry state. Its leaves and stems have obviously been frozen and are squishy to touch. Perhaps there will be some new shoots right down at ground level. Who knows? I thought this was a really hardy plant. 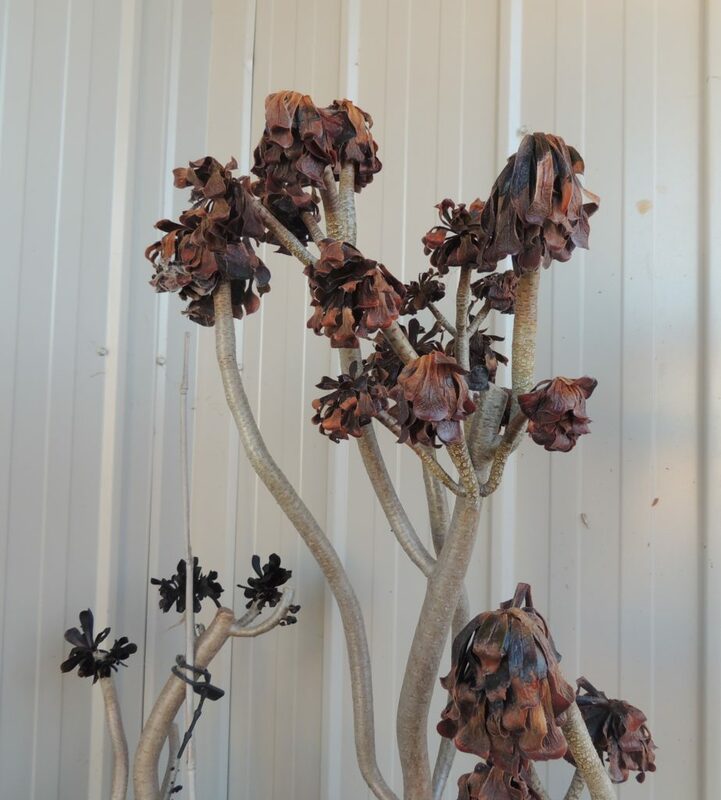 Unfortunately, the flowers of the beautiful Hakea that I posted about in SoS on July 7 are now completely dry, grey and brittle, but the plant is fine. My lovely Geranium 'Rozanne' is a small pile of soft brown leaves prompting me to worry that she won't reawaken, and many of the other plants I thought would survive through the winter have been blitzed. Three: No more sad stories now. Some bulbs are making an appearance: tulips, narcissi, aliums and crocuses are pushing their first green spears above the mulch. 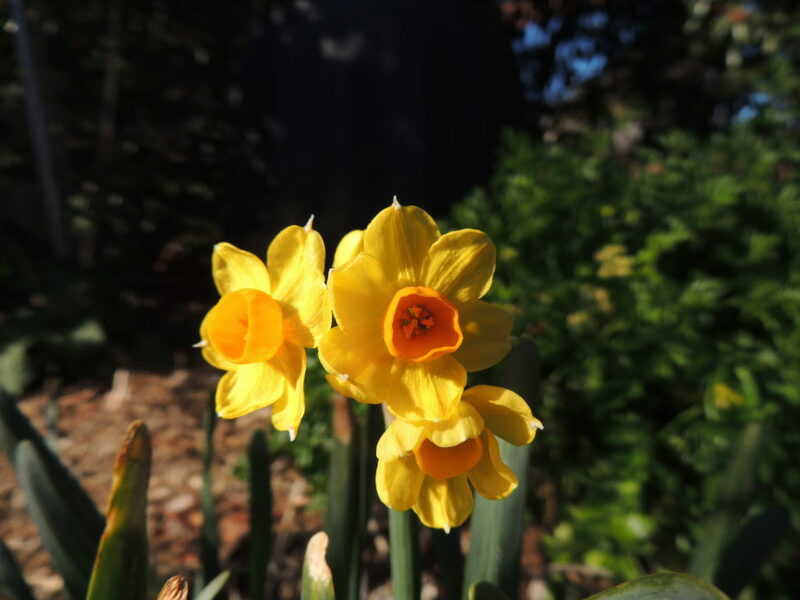 I know this as a jonquil and it's a lovely pop of colour in the winter sun; one of the first bulbs to flower. Four: I don't grow a lot of vegetables, but here there are cabbages, beetroot, broccoli and broad beans, and they're doing really well, even though they didn't get watered for two weeks. Sweet peas (with weeds) are climbing up the frame. Five: This succulent of no particular ID has thumbed its nose at the frost and is pretty in pink, as opposed to its usual grey: an improvement, in my opinion. 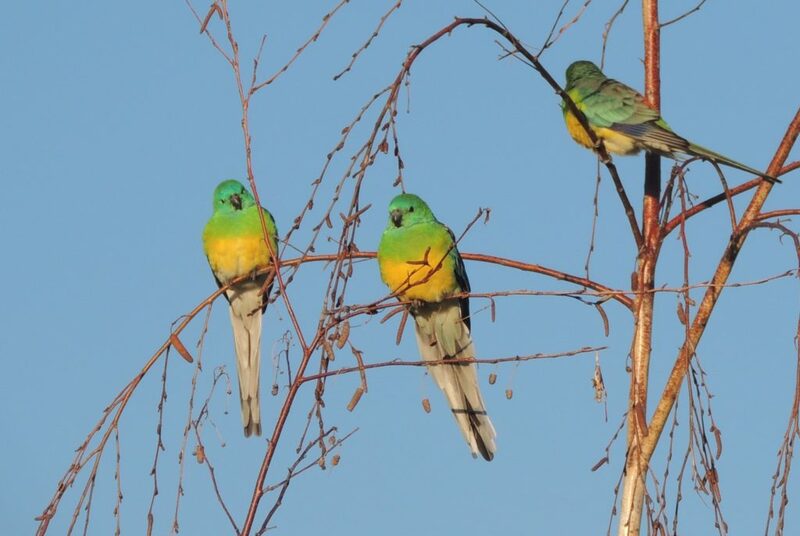 Six: Red rumped parrots, slightly fluffed up against the cold, are sunning themselves in the branches of the silver birches. 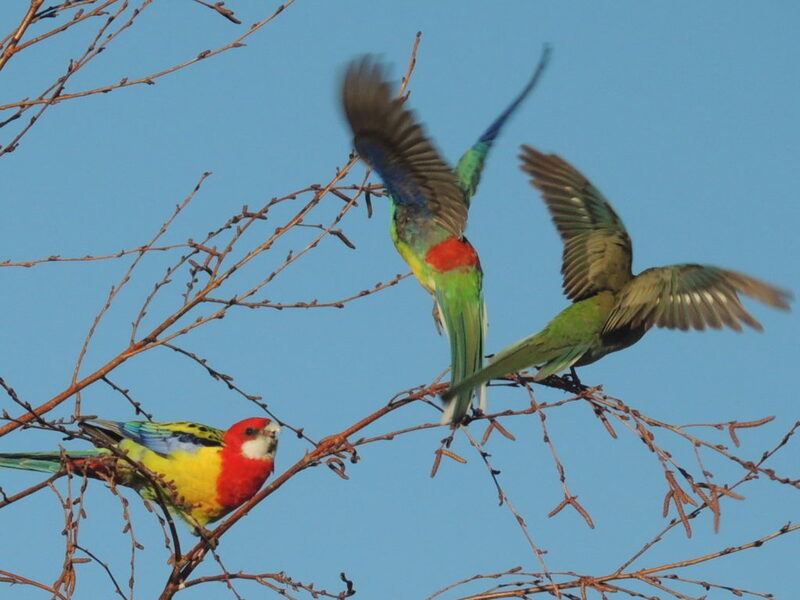 In the photo below, an Eastern Rosella is remonstrating with them: perhaps they invaded his territory. And that's my six for this week. To see what other gardeners from all over the world are doing in their plots, don't hesitate to pop over to The Propagator's site and join the fun. Rain is forecast here today, and everyone has their fingers crossed. It's so dry that kangaroos have moved into the showground to feed on the grass in the big oval. Next Post National Tree Day. My Aeonium is only just picking back up from the winter, but I didn’t bring it in. My own fault as I don’t have a decent space for it inside or a glass house but just survived in a sheltered position. But if it can pick back up in the grim winters North of England I’m sure yours will pick up. Thanks, I hope so! I don’t have anywhere more sheltered to put mine. How observant you are. I didn’t notice that! Poor aeonium … and weird that the succulent is not dead with this frost… You can comfort and warm up with our photos and comments, overwhelmed by the heat wave in Europe this summer! We’ll probably have a heat wave of our own come Summer, Fred. I am enjoying all the northern hemisphere summery posts, though. I see you mulch around your vegetables with hay/straw. Does this help in a particular way? It is so interesting to see the “opposite season” while we are complaining about heat and drought! I put mulch around in the hope that some dampness will be retained in the soil. We have had far less than our average rainfall for this year, so we do everything we can….we are in drought here even though it’s winter. 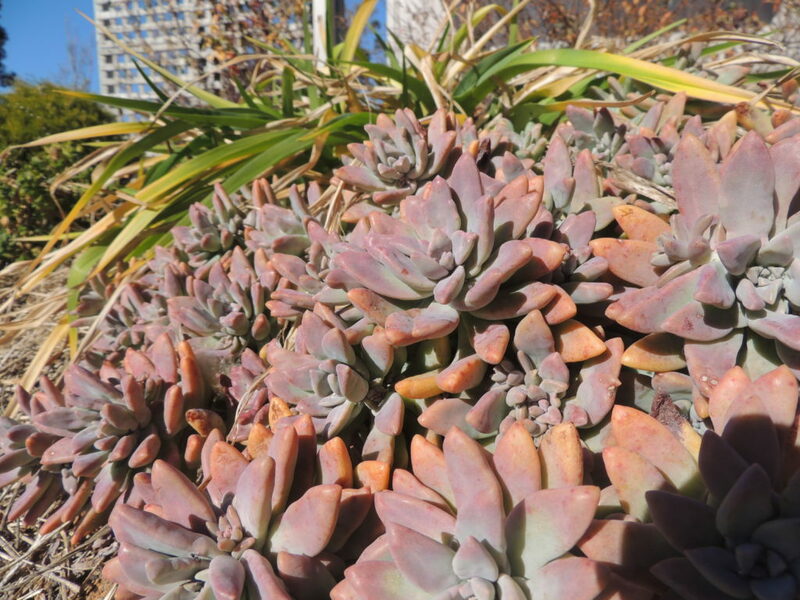 We find Echeveria much hardier than Aeonium, especially if they’re really dry. -7.5 is pretty cold though and ours wouldn’t survive that. What are you getting by day and does the temperature drop gradually through the night such that it’s only that cold for a short while? 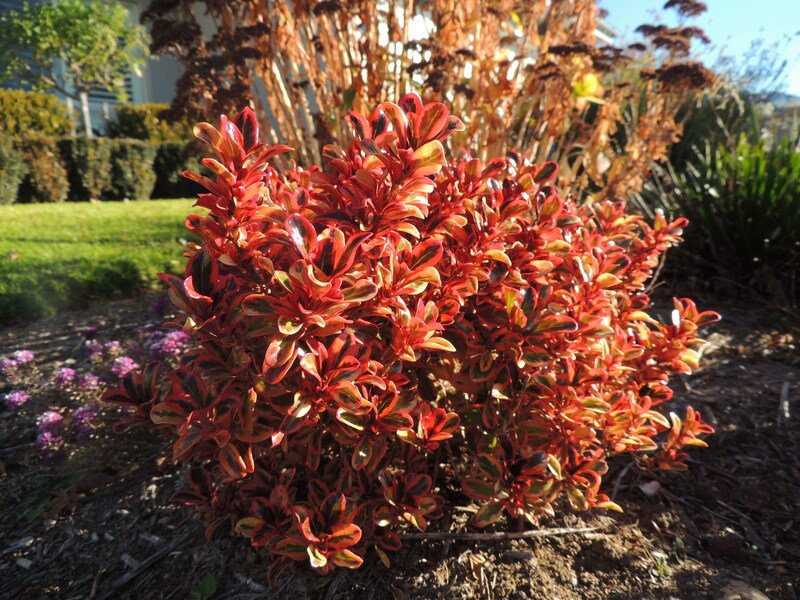 I have a Coprosma that’s still struggling from last winter, wish it would make up its mind, one way or the other. Jim, the temp rises nicely during the day. Today was 19 for example and drops gradually overnight. It’s at its coldest usually, at about 7 am. My echeveria don’t seem to mind the cold. I remember my Mother saying that gardening and a great-looking garden was hard work and I remember her working at it most of the week, so to be honest I’m surprised more of your plants haven’t wilted with the lack of water up your way. Thanks goodness you mulched the veggie patch really well. Yes, Vicki, a garden is hard work and lots of planning, but I don’t mind. The birds are a constant source of pleasure. I’d love it if some would decide to nest here instead of just being visitors. We seem to stagger from one weather event to the next! And you have to be an optimist when you’re a gardener, otherwise we would give up, wouldn’t we? There will be more ‘splashes’. Thank goodness for bulbs..they seem to withstand almost anything. -7.5 would be cold for here, let alone for you. Hope things do come back again, altho this year, we all seem to be having losses to both weather extremes. I think of jonquils as spring, but would this be the middle of winter for you? Both they & the pink succulent are doing their thing regardless. Love the gorgeous birds feuding over a bit of branch. Hi Lora, yes, we’ve just passed the middle of winter: August is usually cold too, but our bulbs start flowering from now. It’s quite normal. We received 2 ml so far, Pauline. Quite pathetic really. Yes, I think it’s been colder than usual. This seems to happen when we have drought…not enough moisture in the air, I guess. I’m sorry for your losses, but we have to have the lows to enjoy the highs even more. As always, love your exotic (to me) birds. So true, Gill, the lot of the gardener, isn’t it? Thanks Cindy. They’re always welcome. Jane, Commiserations on your garden. Hopefully you will get some new growth come spring. At least the birds still enjoy hanging out there. Based on previous experience of losing a beautiful Clematis Alba, I think -7c is a real tipping point for many of the frost tolerant plants. I think you’re right, Tracy. And yes, there are highs and lows with gardening. Keeps us on our toes, doesn’t it? Oh bad luck! But the birds are a lovely splash of brightness! They are, June. And we’ll overcome the disasters as we gardeners always do! Jane did you say minus 7 C? That’s VERY cold, it never gets so cold here! temperatures under zero are a rare occurrence here. I’m sorry for your damaged plants, I hope they recover soon. I see you have tulips and I am green with envy! It’s never cold enough here to get them to bloom. I think cold is a mixed blessing, peonies, tulips need harsh winters to complete their life cycle, roses also appreciate a good winter rest, in my climate roses are deprived of a long winter rest and get stressed and susceptible to diseases in spring. I’ve always wanted to garden in a cold climate, sigh! Have a wonderful weekend! Hi Marcelo, yes, I did say -7! It isn’t usually that cold, I think it’s the drought conditions we’ve been experiencing. This is the first time I’ve grown tulips, so I’ll be interested to see the outcome. I’ve never had any luck with peonies- I have just one in this garden and it hasn’t done anything so far..perhaps this spring! Oh that is so disheartening when you come home from some time off to discover some of your garden hasn’t made it through rough weather. We had a nasty heat spell here in Chicago while we were in Wisconsin for just a few days and in that short span lost a Lilac bush. It was put in a few months before the heat spell, so in theory had enough roots to see it through but this last wierd weather patch was really rough. So I feel your pain. I am impressed with your tidy veggie patch!! Thanks, Laurine. I plant things that are hardy, but when it’s really cold, there’s not much more I can do. I would never have considered covering that Coprosma over, for instance. We gardeners are always subject to the vagaries of the weather, aren’t we? My veg garden is very small, so not difficult to keep tidy! That is chilly and I am amazed at the echeveria looking so good. Presumably it’s feet aren’t wet. But I’d expect the fleshy leaves to freeze. Most plants are hardy to around -5 degrees and I lost several this spring because it got very cold. Oh, well, you have to be optimistic and although it is sad to lose a plant it is also an excuse to buy new ones. Those parrots though are brilliant and a very cheerful sight. And spring bulbs too! The Echeveria is in a raised bed, so well drained, but as well as that we haven’t had much rain, so wetness isn’t really a problem. Agree about the excuse to buy new plants…I’m always being tempted! I can’t even imagine temperatures that low, Jane – I don’t think I’ve ever experienced that kind of cold, with the possible exception of one tour stop in Alaska in early September. I hope ‘Swartzkopf’ recovers for you. Your colorful birds, as usual, made me smile. There are some wild parrots here, the progeny of escaped pets. I actually think I saw one yesterday but I didn’t get a close look before he flew off. It would be delightful if those birds took up residence in your garden Kris- it would certainly be a good environment for them. One thing about our very cold frosty mornings is that we usually have beautiful sunny days afterwards. One is forever reading about how hardy Coprosma repens is but it has its limits. When we lived in The Catlins we planted three plain green ones out in the paddock thinking they’d be tough as. Nope! They did well initially but we had a winter or two with a lot of cold strong westerly rain-bearing winds and they just slowly died. Since you haven’t had lots of rain perhaps the cold alone can do them in. And yours is a pretty cultivar that I imagine would be more sensitive anyway. As far as I know Coprosma repens is remarkably hardy further north in NZ and very hardy in terms of coastal exposure and salt tolerance. I’m sure you’re right about the pretty cultivar not being hardy, and the lack of rain might have something to do with it too. Oh well, that’s the lot of the gardener- there’s always tomorrow and next season! I love just reading along in your post and all of a sudden you mention KANGAROOS! Such a foreign but delightful concept for your American readers! Love it! Oh the kangaroos! There are so many of them. We think bears are a foreign concept! Thanks for your comment, Shannon. I know your seasons are different but I’m still amazes to see your jonquil in flower as yr geranium is dying ! Here, I would say cut the geranium back and it will come through again but is that your experience? We had a very cold winter here and mine did. Fingers crossed for you. I hope the geranium will come back: it’s the first one I’ve grown so I don’t know how they perform. Until the heavy frosts a couple of weeks ago, it was still flowering. Thanks for your comment. Here they do disappear over winter but new shoots come through in the spring. That’s probably what will happen here then. Thanks. 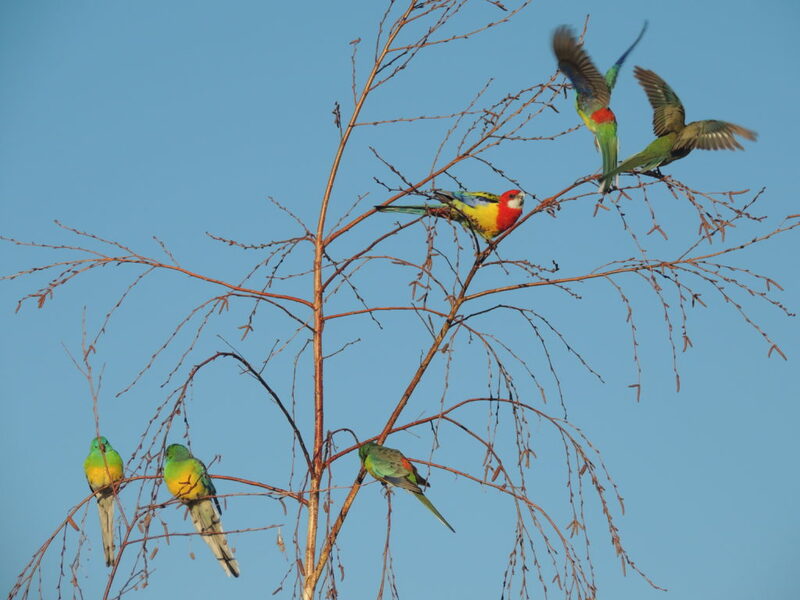 Love the parrots and those narcissi. I forget it’s not summer everywhere! True: we have it all to look forward to! They’re bright and cheerful in the winter! We’ve been hearing from family and friends about the very cold winter, while we are enjoying a hot summer in Canada. Sorry to see all your beautiful plants in such a sad state. Hopefully they will regenerate with some TLC. Thanks, Carol, if they don’t survive, I’ll replace them with something tougher. Enjoy Canada! I spy an opportunity to bag some new plants! Funny to see spring bulbs emerging in the height of (our) summer. We shall be glad of a shot of summer brightness when we get to the bleak mid winter. Much as I’m feeling now looking at all the gorgeous Northern Hemisphere flowers! Poor old aeonium – hope it recovers. Lovely Echeveria – it looks a little like one I bought in Cornwall last year called ‘Duchess of Nuremberg’. I think it will recover as only the leaves seem to damaged; the trunk is still ok.Thanks for identifying the Echeveria. I sure hope you got that promised rain. I seem to be hearing about hot, dry conditions everywhere today. I’m sorry to see the frost damage. I’ve seen so many plants come back from what looks like sudden death that I’ve learned not to throw in the towel too early. I hope all your plants revive. Thanks Alys, we received a small amount of rain, but certainly not enough to put even a puddle in the farmers’ dams. I won’t be cutting my plants back yet as the dead leaves provide some protection until the frosts are over. Not too long to wait now, I hope!